When living in a city as large as Cambridge, you need to have a driving instructor who has extensive local knowledge. Luckily, here at driveJohnson's, our driving lessons in Cambridge are taught by the most experienced instructors in the area. driveJohnson's Cambridge is approved by hundreds of students each year from the Cambridge university and local colleges such Kings College, Trinity college, Gonville & caius, Clare college, Peterhouse college Christs college and more. We welcome different pick up and drop off locations for your convenience be it if you are studying or working - just let us know at the beginning of your driving lesson! Pupils who have recently passed with us in Cambridge. From parallel parks and forward bay park, to free theory test training and how to deal with driving test nerves - driveJohnson's driving school in Cambridge is the only one to provide support throughout your entire learning journey. We'll build up your confidence in quieter areas such as Milton, Arbury and Cherry Hinton before tackling roundabouts such as Milton Roundabout (spiral roundabout), Histon Roundabout (spiral roundabout, Histon road-Victoria road). There are also tricky roads such Mitchams corner (multiple lane one way system) and the A14 from Oakington to Dry-Draton bridge where there is a naughty junction that appears suddenly. With our extensive local test route knowledge you should be fully prepared and ready for your practical driving test. 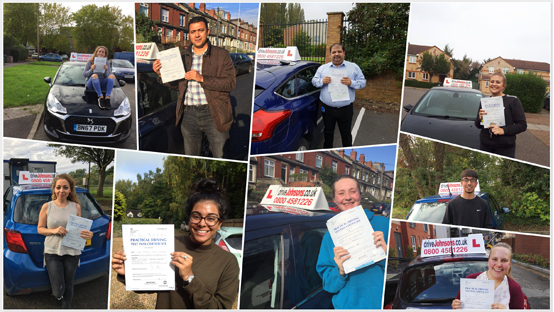 Join the thousands of people who are part of the 'pass first time club' with driveJohnson's and breeze through your test with our excellent teaching.